Having sent in my absentee ballot for today's election, it's a good time to think about the women who came before us, and earned me (and eventually my daughters) the right to vote. Well, I don't have the right to vote in France, but that's because I'm American, not because I'm female. 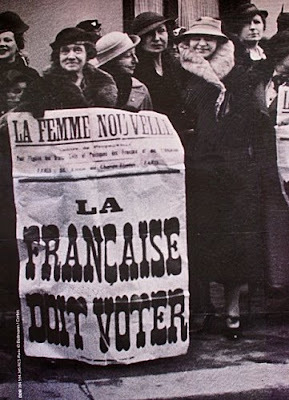 The US gave women the right to vote in 1920, and French women were accorded that same right in 1944, though they didn't get the chance to exercise it until April 1945, when World War II, the Nazi occupation, and the Vichy government had all finally ended. 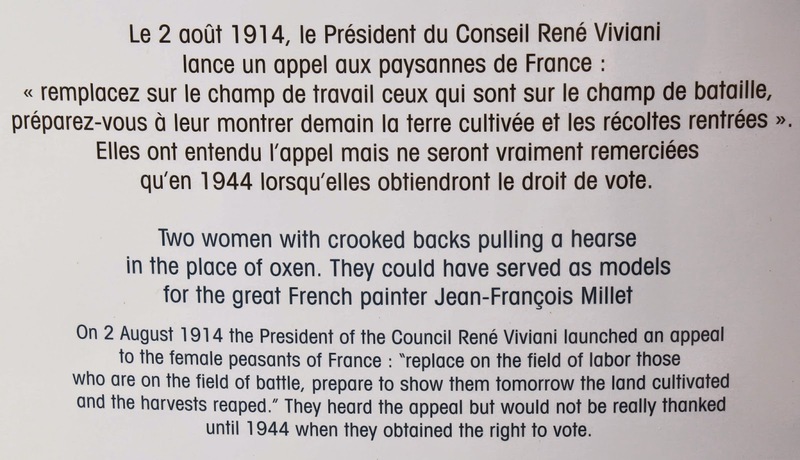 It's interesting to note that France was one of the last Western European or developed countries to grant women the right to vote: exceptions being Italy in 1945, and Switzerland in 1971 and Portugal in 1976 (!). Oh, Switzerland and Portugal: How could you? My mind boggles. And don't even get me started on some of the other countries in Africa (e.g. South Africa, 1994) and the Middle East (e.g. Saudi Arabia, 2011). Perhaps it's no wonder that France was one of the last developed countries to fall (or really, I should say rise to the occasion), given how patriarchal it is; all titles, land, and inheritance historically went to male heirs only. Coco from France, pays careful attention to her appearance. But her big dream is to become a fashion journalist! She has a real passion for the color pink! She is very entrepreneurial and likes to help others! She is always late! To unwind, all she needs is to get a shampoo and a hair-brushing, or to pass some time getting a manicure! And as horribly stereotypical as Violet is, I personally would still rather live with her stereotype than Coco's. Is that really what the world thinks of French women? 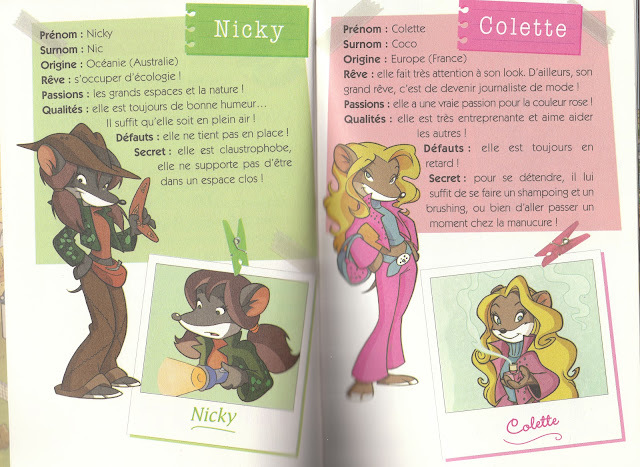 I sometimes fear that's what French women think of French women. Just look at the state of girls' soccer here. When we moved here, we looked into a soccer program for our girls. There was only one within the city of Paris, started by an American woman and populated almost entirely by foreign girls or French girls who've returned from overseas. I believe, three years later, there are still only one or two girls' teams. The view from the practice field can't be beat. Unfortunately, the soccer program can. Until 6pm, the field is full of boys playing at a level somewhere just beneath World Cup. Then the field empties off, as sane people go home to get ready for dinner and bed. That's when the girls are given the field. Because there's just the one girls' team, it's comprised of about 12-20 girls (depending on the day) spanning the ages from 6-12 or so. This means that there are few children at any given level appropriate for anybody. Also, I am reminded of King Kalakaua of Hawaii who was very excited to be the first in his kingdom to have a telephone. Since that was pre-trans-Pacific-cables, it begged the question, "Who would he call?" 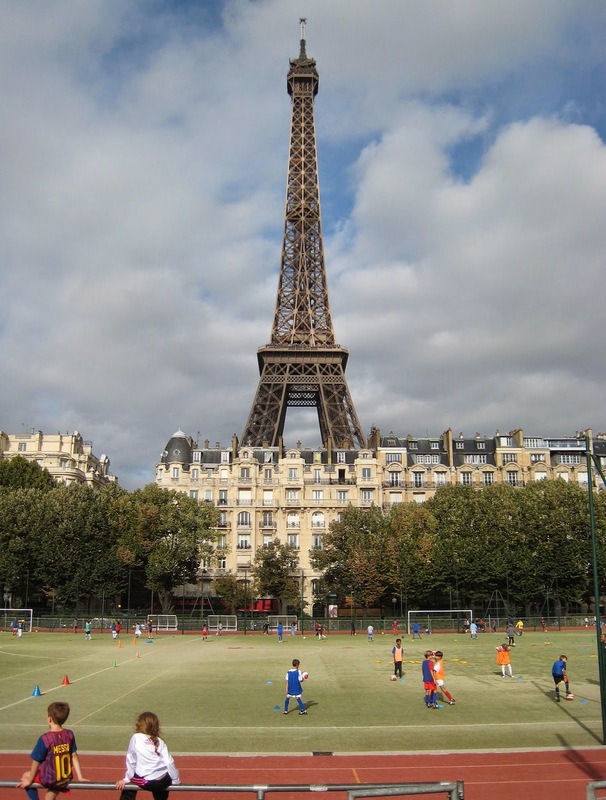 Well, since there's only one girls' soccer team in Paris, there is nobody to play against, unless you head out to the suburbs. But the ultimate kicker is that there is remarkably little kicking. The French coaches (one woman, one man) seem to think that girls should learn soccer ever-so-differently (and more delicately) than boys. The first hour is spent doing warm ups: relay races, obstacle courses around cones, and -- most bizarrely -- large games of keep-away and passing where they run around the field throwing the ball to each other. They do not actually touch the ball with their feet until the last 15 minutes, when they put on colored jerseys, split up in teams, and play complete free-for-all games with no interference, guidance, or, frankly, coaching from the coaches. I once gently chastised a friend of mine -- a doctor no less -- for smoking when we were attending the funeral of a young woman who had died of cancer, and she replied, "Yes, sadly, smoking is the one area where French women have achieved parity." As of a September 2012 report, France was #37 on a list compiled by the Inter-Parliamentary Union for percentage of women in the parliamentary lower and upper houses, with 26.9% and 22.2% respectively. Not only are they behind the countries you might expect, like all the Scandinavian nations, the Netherlands, Germany, and New Zealand, they are also behind Spain, Mexico, and, more shockingly, Rwanda (#1 on the list with 56.3%! ), and even Afghanistan. But, my fellow Americans, don't get too smug yet. On the same list, the US is tied for #80 with 17% in the House and 17% in the Senate. Not only is the US soundly beaten out by France and all the above mentioned countries in terms of female representation, we are also below the United Arab Emirates, the Dominican Republic, the Philippines, and Pakistan. Meanwhile, the popularity of French President François Hollande has sunk even further, to a new historical record-breaking low approval rating of 13%. And Anne Hidalgo is serving as the current mayor of Paris -- the first female mayor of the city, elected half a year ago, in March 2014. I can't find any official statistics on her approval rating, probably because nobody bothers to take a poll, probably because she seems rather well-liked. In any event, I think Parisians of nearly every stripe would pick her over Hollande. So when it comes to sexism and politics, who's 25 years behind whom? I think there's room for improvement on all sides, frankly. 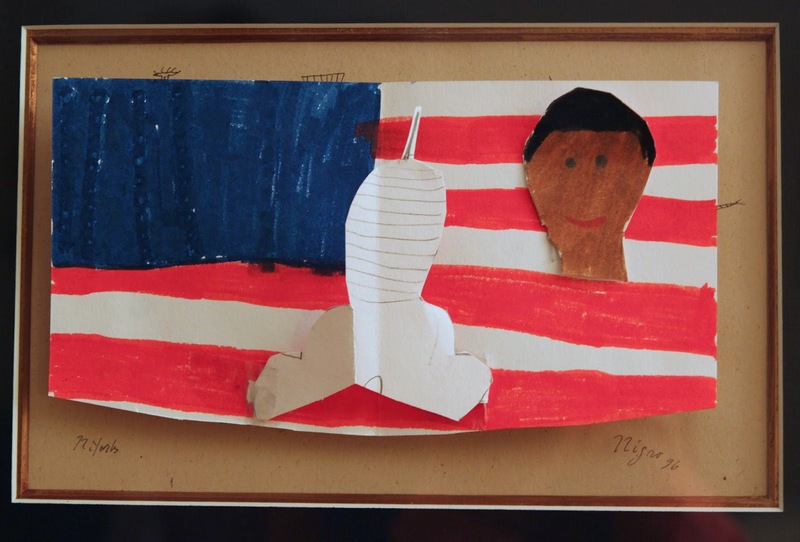 I leave you, on American election day, with this politically-minded piece of art, made by Gigi at age 8, which has been hanging up in our apartment for the past three years, taped onto the glass of another drawing. Get your mind out of the gutter. That's President Obama and the White House. Also sometimes called Tomme (or Tome) d'Estaing, this is a raw sheeps' milk cheese from southwestern France. It originated in the village of Estaing in the department of Aveyron in the Midi-Pyrénées region. Nowadays, it is generally made in an area around there, starting in the department of Lot (neighboring department in the Midi-Pyrénées) all the way to the plateau of Larzac (at the southern edge of the Massif Central), about 80km from each other. Though it's an old village, a classic in fact (and officially one of the Most Beautiful Villages in France), it's not an old cheese. Well, it is an aged, old cheese; it's just not a traditional, ancient cheese. It was created in the mid 1990s by some local farmers. It's a pressed, non-cooked cheese, with a creamy-rubbery interior, and a crust so rough, even I am not tempted to eat it. The interior however, besides have a nice soft texture, also has a nice soft flavor. It's mild but not boring, sheepy but not gamy, and with balanced hints of sweet, tang, and salt. This connection is not immediately evident to you, but makes perfect sense in my head. My favorite French President is, and always has been, Valéry Giscard d’Estaing. It has nothing to do with his politics or his achievements, neither of which I know anything about, seeing as how he was France's 20th president from 1974-1981, when I was just a little kid, starting to learn French. I simply love saying his name. D'Estaing. It's such a great word (and probably comes from the same root as the word "étang" meaning "pond"). So because of the political nature of the story, I choose a cheese that has links, in name at least, to one of my favorite politicians, even though he's a man. Still, I'm not about to choose a cheese that reminds me of Marine Le Pen.